Built in the first half of the twentieth century, reclaimed from physical decline at the start of the twenty-first and providing independent entertainment in an inspiring setting today. That opening sentence perfectly describes both the Hailsham and De La Warr Pavilions: two venues, 10 miles apart in East Sussex, that are worth visiting for the buildings, let alone the high standard of art, live music and film they make locally available. 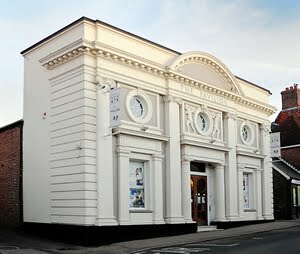 The Hailsham Pavilion was built as a cinema in 1921 and opened with a packed performance of Charlie Chaplin’s ‘The Kid’. It was a cinema until 1965, when it began twenty dismal bingo years that were ended with purchase by developers (oh, how very 1980s) who left the building empty and decaying. Rescued by determined campaigners and councillors, it reopened as a cinema in 2000. Ninety years on from that Chaplin picture, it is a joy to watch a film here today. The elaborate classical façade gives way to a plush, warm interior that transports you back to the days of the music hall and the picture palace. Staffed by enthusiastic and knowledgeable volunteers, the 200-seat capacity is small enough to be intimate but large enough to provide the communal experience very often missing in the ‘viewing booths’ that good films are relegated to in multi-screen cinemas. New releases are a couple of weeks behind the greedy, soulless multiplexes but with cheaper seats and better ethics and aesthetics, this local independent cinema is the one to support. Its regular music performances have made the Hailsham Pavilion something of a staple of the folk music diet. Folk royalty such as Peggy Seeger, Norma Waterson and Eliza Carthy have performed in recent years, as have the Oysterband and Fairport Convention; and Sussex legends the Copper family gave a memorable performance in the run-up to last Christmas that left me warm, festive and fuzzy. The De La Warr (pronounced Delaware) Pavilion in Bexhill-on-Sea was built in 1935 to a design by leading modernist architects Erich Mendelsohn and Serge Chermayeff. Commissioned by Herbrand Sackville, 9th Earl De La Warr and socialist Mayor of Bexhill (sounds very incongruous), the building is a stunning beacon of sweeping art deco lines and industrial concrete, steel and glass. A major regeneration project in 2005 rescued the building from neglect and inappropriate alterations and established it as a contemporary arts centre. The large gallery spaces have attracted exhibitions by high profile artists such as Grayson Perry, Joseph Beuys and Anthony Gormley, as well as lesser lights and emerging talents. Chris Petit and Iain Sinclair’s 2009 film installation was a particular highlight: a 12-screen musing on another south coast slice of art deco 5 miles east along the coast at St. Leonards, ‘Marine Court Rendezvous’ was a dream-like surveillance of life in a modernist behemoth. The highlight of the De La Warr though, is the 1,000+ capacity performance space that is increasingly attracting popular and/or leftfield musical acts. I have been to excellent gigs by Band of Horses, Richard Hawley and The Fall (twice) here; what makes it so good is the sound and size of the auditorium and also the enthusiastic response of the performers and the audience to the quality of the venue. Any venue that brings the mighty Fall to my doorstep must be good; for Mark E. Smith to come back, it must be incredible. Don’t go to gigs in Brighton or London, just go here.